The Digital Camera Photographer of the Year and Young Digital Camera Photographer of the Year competitions are now in full swing, with entries now coming in for the first two categories in this eight-round photography contest. The black-and-white category, Mono Magic, is proving particularly popular among entrants looking to win the £12,000-worth of prizes on offer. Shooting in black and white has a magical way of simplifying a scene, and creating a strong dynamic that is reduced to shades of grey. Here are six entries to the Mono Magic category in the contest that have caught our eye so far, and the reasons why we think each image works so well in black and white. Shooting in black-and-white gives an immediate advantage when shooting portraits. With colour removed, clothes, make-up and skin imperfections are removed too, allowing you to concentrate on the form of the person’s face. This image was captured by Trevor Cole, and it shows a boy he met on the streets of Jinka, Ethiopia. The subtle side lighting accentuates his features, and ensures his bright eyes are the focus of his ambient-light portrait. Monochrome allows the photographer to accentuate the difference between light and shade, and this is particularly useful when shooting architecture or landscapes. In this image, shot by Peter Földiak in Spain, the texture and zig-zag shapes of the wooden pier are highlighted by the way that the fading light of the sun sweeps across the surface. Most cameras and phones allow you to shoot in black and white, but it's often better to take the picture in colour and then convert it to monochrome using photo-editing software. This allows you to adjust the contrast and brightness of different parts of an image depending on their colour. This is particularly useful in landscapes, such as in this shot of Bamburgh Castle by Waldemar Matusik. The grey clouds can be made to look more threatening, whilst the texture of the dune grasses can be accentuated. Shooting black and white is usually a great way of emphasising pattern in a subject. This image, captured by Simon Hadleigh-Sparks with a Sony a6000 and a 19mm f/2.8 lens, is of nothing more complicated than pieces of folded paper, which are arranged into tear-like shapes. One of the most important things about black-and-white photography is that it immediately makes your picture look more artistic – and makes it much more than a snapshot. 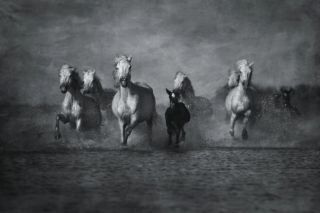 Because of this, it's a great tool for creating a more abstract and ethereal image, such as in this image of Camargue horses running through the water with their foals. Taken by Janine Lee, the image has been selectively smudged and softened in post-production to deliberately give it a more painterly look. In black-and-white images, it's usually the brightest part of the image that catches your eye first. If, however, the majority of the frame is made up of bright tones, it is the darker elements that catch your eye. This optical effect is used beautifully in this simple seascape shot by Grace van der Heide, which she shot on a very windy day at the beach with her Canon EOS 7D Mark II. You can enter the Mono Magic category of our competition until 20 November 2017. The winner of the Mono Magic category will win a copy of Affinity Photo photo-editing software, an Affinity Photo Workbook, and a Fujifilm Instax SQ10 hybrid film-digital camera worth £250. The overall winner of the Digital Camera Photographer of the Year 2018 competition, sponsored by Affinity Photo, will win an amazing bundle of prizes worth £4,800, including a Fujifilm XT-2 camera, two Fujifilm lenses and an iPad Pro. The winning entries will be displayed in a special exhibition at The Photography Show at The NEC in Birmingham from 17-20 March 2018. Entries are also currently open in the travel photography category, On the Road. Other categories, which will open in the following weeks, include wildlife, macro, portraits, landscapes and street photography, together with a special category for images taken on a smartphone.